My workshops are ongoing and are scheduled when you contact me. The classes involve the designing, forging, annealing, hardening, and tempering of high grade tool and/or stainless steels that I have worked with for many years. The object is to create a knife blade to which we will attach a guard (before hardening) and then a hardwood handle to finish the job. I have been, in the past, a demonstrator for both the California Blacksmith's Association and the Artist Blacksmith Association of North America at their conferences. The price with all materials included is $400. Seven culinary and utility knives in inventory, December, 2018. Seven utility knives photographed May, 2018. Four Knives featuring scrimshaw by Steve Magill photographed December, 2017. A group photo of the inventory of kitchen type knives on hand at the end of May, 2016. These knives are subject to prior sale. A carving set by Karl Schroen with scrimshaw by Steve Magill and a box by Ron Brotherton. Photographed by Jim Cooper. Three photographs made at Karl Schroen's forge while he was working. Photographed by Ron Koeberer. Six knives by Karl Schroen. Photographed at the beginning of 2003, these knives include some new developments in steel and handle materials. A gallery of nine color photographs of knives by Karl Schroen. A variety of functional and beautiful styles are available. 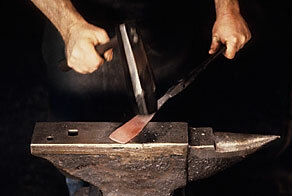 All are made of hand forged modern tool steels such as ATS-34, a high carbon stainless steel. Karl Schroen's how-to book published by Knife World. Currently out of print, a new edition is in the works. A look at the cover and table of contents of the previous edition of this well regarded book that is illustrated with photographs showing Schroen's working methods. 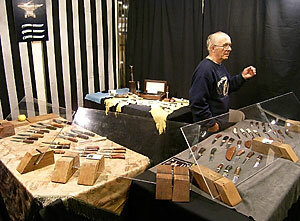 Cutler and author of the book, "The Hand Forged Knife."